We are enamored with superheroes in our country. It’s a part of our culture and I think captures our inherent desire to overcome adversity and help others. To fight for good. The problem is we actually need real ones today. And lots of them. I’m encouraging my kids and grandkids to be their own superhero. I want them to know that each one of them is strong and each one of them can make this world a better place. This is an especially important message to kids who are marginalized in some way, and in our case, our transgender son. But it is my message to everyone. This isn’t the time to be afraid. This isn’t the time to back away and let others fight the fight. It’s time for all of us, the sleeping giants, to realize we have a greater mission in this world. Get your mask. Get your cape, if you’re so inclined. It’s time to enter the fray. So what kind of superheroes do we need? Much of the suffering and violence in the world today is caused by those who cling to a world-view that is narrow and unbending and unaccepting of any differences. A world-view that cultivates intolerance. A world-view that sanctions discrimination and denies rights to those who are different. I think this is a good place to start for our superheroes. If there is one thing our country should agree on, it is embracing differences. If there is one thing our country should get right, it is equality and justice for all. And yet, while we preach against the oppressive forces in our world, many of our own citizens and leaders seem unable to accept differences right here in our own country. People who should know better, but continue to deny rights to those who deserve them. First and foremost, our superheroes should be a voice for equality and stand up for the underdogs. I’d venture that most people would already say they stand up for the underdogs in this world. And I’ll bet every parent has talked to their kids about standing up to bullies. Yet many of these same people fail to support those who need it most. The marginalized communities. People of different races, ethnicities, nationalities, religions, and the most persecuted and least understood, our transgender and LGBQ communities. Ironically, I’ll bet many of those same people who vehemently oppose equality for marginalized groups love taking their kids to see superhero movies. They love watching the defenders of equality and justice stand up for the oppressed. If only people realized they have an opportunity, in real life, to be a superhero to a kid in need. Especially for transgender and gender non-conforming kids, who see a world of adults condemning them just for being who they are. Gender identity seems particularly hard for some to grasp. I know there are some who will never get it. I guess that’s life. And that’s why we will always need superheroes. But I believe many more will open their hearts and minds. For some, all it will take is getting to know a transgender child and their family. It’s why we tell our story. For some, it will require a deeper understanding of the nature and science of gender identity. It’s why we strive for education. Our family, among many others, has been working with Michigan’s State Board of Education to provide basic guidelines to our educators so they can help create a safer, more inclusive environment for LGBTQ kids. The guidance is now being revised after multiple public forums and thousands of on-line comments were considered. The updated version will be released and reviewed later this summer. The recommended guidance, however, has led to a firestorm of resistance. Much of the tempest has been directed at transgender students, their families, and the people standing up for us. Some of it comes from people who believe the predator myth, though it has been thoroughly debunked. Some of it comes from religious extremists, who condemn anyone who believes differently. And some of it comes from the legislators. It led to two bathroom bills being introduced in Michigan, part of the massive wildfire of legislation spreading across the country by those who seek to deny civil rights for the LGBTQ community. And that was just the beginning. Along with ten other states, Michigan’s Attorney General now seeks to overturn federal guidelines for schools on protecting the rights of transgender students. Specifically, their lawsuit challenges the inclusion of gender identity under Titles VII and IX, despite the strong justification for it. The guidance offered by the Federal Government is essential for the health and safety of these kids. They are the most vulnerable of the vulnerable. They have no protection against discrimination. And they are at the highest risk for harassment, bullying, assault, and suicide. Not everyone is giving in to the fear, however, as a dozen states have now filed a counterpoint brief showing why these protections are strongly in the public’s interest. Thankfully, there are people who recognize we have an obligation to provide rights for all our citizens. Our military has recently taken sides, ending the ban on transgender people being able to serve openly. They realized our transgender soldiers make our military stronger. They make our country stronger. The contrast between the U.S. military’s position on transgender service and those opposing transgender rights is stark. Our military personnel put themselves in harm’s way for everyone’s sake. That makes them heroes. And by standing up for the most vulnerable, our military personnel are superheroes in my eyes. They have taken a bold stand, joining the Department of Education, Department of Justice, and our President. I am grateful. 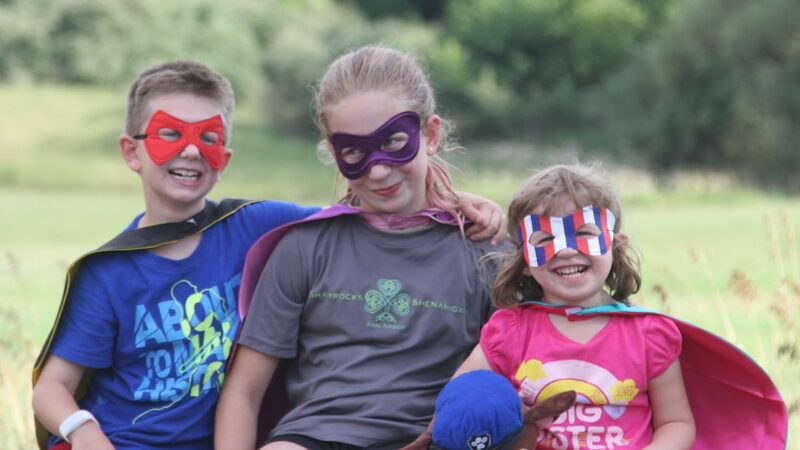 Our family is also fortunate to have superheroes in our everyday lives. People who know they will face criticism, yet advocate for the transgender kids in our schools. People like our elementary school principal, Craig McCalla, and the President of Michigan’s State Board of Education, John Austin. Leaders who take a stand for all kids, including the most vulnerable. The classmates and friends of my son who know he is transgender and treat him just like any other boy. My son’s sisters and the siblings of many other transgender kids, who are often their fiercest allies. And of course the strongest of all, our LGBTQ and other marginalized kids, who not only deal with their internal struggles, but face a society that opposes them just for being who they are. It comes down to courage. And they have it. I’m calling for people to summon their courage and not give in to divisiveness, hate, and fear. I’m calling for people from all walks of life, the sleeping giants, to awaken and become a superhero for a kid in need. Hold our leaders accountable to support the rights of all our citizens, including LGBTQ and all those who are marginalized. Some will do the right thing. Make your voice heard against those who try to deny equality. Embrace all differences, whether of race, religion, gender, ethnicity, sexuality, and all those who do not fit within a neatly labeled box. Show the world we are not hypocrites when it comes to equality and justice for all. Lead by example and we will make this great country of ours even greater. We will make the world a better place for all kids. I’m calling all real superheroes. Oh, and if you must have a cape, make sure it’s quick release. Remember The Incredibles.